Bernie Daniels re-enlisted in the Army when the United States decided to join the fray of World War I. Having already served in the Philippines, Mr. Daniels, served again with the US Army’s 5th Infantry in France. One hundred years ago, in 1918, Mr. Daniels fought in multiple battles. Americans, including Mr. Daniels, helped to push back the German Spring Offensive. He then participated in two American Expeditionary Force (AEF) led battles: St. Mihiel and the Meuse-Argonne. Mr. Daniels fell in combat on October 14, 1918, during some of the heaviest fighting the 5th Division saw outside of Montfaucon, where the American Monument to the Meuse Argonne now rests. The 47-day Meuse-Argonne remains the bloodiest battle in US history, with over 1.2 million Americans fighting and over 26,000 giving their lives to end World War I. Mr. Daniels is one of 14,246 servicemen buried in the Meuse-Argonne American Cemetery in Romagne-sous-Montfaucon, France; it is the largest US cemetery in Europe. After her son’s death, Mrs. Mollie Daniels, joined thousands of mothers and widows on Gold Star voyages to see the final resting place of their sons and husbands. In 1930, Mrs. Daniels crossed the Atlantic to visit her son, Bernie Daniels, pictured here. Mrs. Mollie Daniels’ great granddaughter, Mrs. Gail Burhnam, learned about UCF’s research when she read articles that appeared in the Orlando Sentinel this summer. 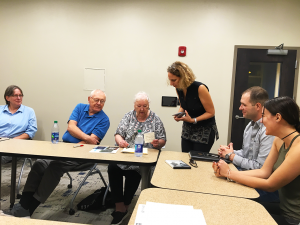 She recently came to share their stories and allow the VLP team to archive the documents of her great-uncle and great-grandmother experiences. When she arrived, UCF VLP students had already done some preliminary research. “You all seem to know as much about him as I do,” Mrs. Burnham joked after meeting with the team. Her visit demonstrated the impact of UCF’s VLP. Students appreciate knowing that their research is reaching the public. “It is great to see our work transcend the classroom,” says graduate student Walter Napier, “it really brings a sense of pride knowing that our work inspired a local resident to share her family’s story, which we can now use for teaching and research purposes.” The University of Central Florida, the History Department, the Center for Humanities Digital Research (CHDR), and the VLP Team would like to thank Mrs. Burnham for being willing to come and share her family’s story with us. By combining historical research with community outreach, UCF’s VLP honors the legacy of America’s veterans.